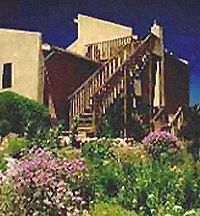 Heart Seed Inn and Spa: spectacular mountain views from 6 guest casitas near the historic Turquoise Trail with massage, hiking, yoga, and horseback riding. The Heart Seed offers a quiet mountain retreat and romantic getaway with breathtaking sunsets and sunrises. Six spacious guest rooms with Continental Plus breakfast, kitchenette facilities, private baths, Santa Fe decor, queen beds, and private entrances. Activities nearby or on the premises include: massage, hiking, yoga, birdwatching, stargazing, and horseback riding. This and other Santa Fe Bed and Breakfast Inns can be found here in The Register.